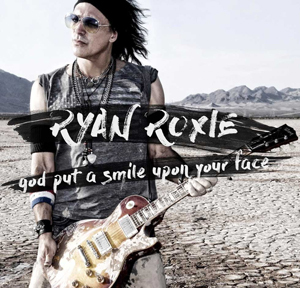 RYAN ROXIE (Alice Cooper guitarist) has released a new lyric video & single for "God Put a Smile Upon Your Face". The song is taken from his new solo album, Imagine Your Reality, which was released on May 25 via Cargo Records UK. The video can be viewed below. A COLDPLAY song would not be the obvious tune to cover on a 'guitar-driven' rock record like Ryan Roxie's Imagine Your Reality. Not the obvious choice, but the correct one. Roxie takes the melancholy mood of the COLDPLAY classic and injects a punkish energy to it with layer upon layer of raw guitar tracks while still staying true to the song's dark timbre. Complimented by a new enigmatic video shot on location in the Las Vegas Desert by Director/Cinematographer Denise Truscello with graphic lyric overlay by Gustav Kronfelt and additional editing by Jonny Vegas, "God Put a Smile on Your Face" will do to you just what the title suggests. "God Put a Smile Upon Your Face" was produced by Kristoffer Follin at Purple Skull Studios in Stockholm, Sweden and is the 5th song released off of the Imagine Your Reality album. "Me Generation", "To Live and Die in L.A.", "Over and Done", and the summertime classic "California Man" can all be checked out on YouTube and/or Spotify. Ryan Roxie - Guitarist, vocalist and songwriter, who is best known as Alice Cooper's longtime lead guitarist and collaborator, has also worked with Slash and Gilby Clarke and been a member of Classic Rock award-nominated band CASABLANCA. Roxie began working with Alice Cooper in 1996. He was initially offered a 'one year tour' and 22 years later (with one leave of absence for family commitments) he’s become an integral part of the band. In 2000 Roxie wrote and recorded on SLAH'S SNAKEPIT's second album Ain't Life Grand. Ryan Roxie's new music is currently being featured in the U.S. on Eddie Trunk's Sirius/XM radio show, in the UK on Joe Elliot's Planet Rock radio program and Rick Palin's Firebrand radio. Roxie also appears on the Nights with Alice Cooper syndicated radio show as well as getting regular rotation on both Sweden's Bandit Rock and Pirate Rock radio along with many other rock and alternative stations that are proudly supporting the return of 'guitar-driven rock'.